At some point in their careers, most writers indulge, however briefly, in the fantasy of selling one of their stories or novels to the movies or television. Nothing wrong with that. If you sell an option for a year, you get some money from that; if you sell the film rights outright, you get a whole lot more money. My friend Brian Keene makes no bones about this subject; he readily admits that selling the film rights to The Rising was what enabled him to quit his job(s) and become a full–time writer who didn’t have to worry about where the next meal for his family was coming from. Brian has also seen some dandy short films made that were based on a couple of his short stories. Coincidentally, I happen to have a story about just such an endeavor. This essay was slated to appear in an online ’zine named Cryptopedia that, to the best of my knowledge, never published a single issue, much to my disappointment and annoyance. Below, you’ll find the essay in its entirety, as it was written when the rough cut was still being assembled. I’ll have a few more — and more recent — comments at the other end. As I write this, I am less than a week away from seeing the rough cut of the short film being made of my story “Rami Temporales” (originally appearing in Borderlands 5, known in paperback as From the Borderlands). The film, written and directed by Earl Newton, is now titled One of Those Faces (the story’s original working title) and will be debuting the first week in September (about the same time the first issue of Cryptopedia hits your computer screen) on the Stranger Things TV website: (http://www.strangerthings.tv/). Oddly enough, I’m not nearly as anxious as I thought I’d be. Mostly what I am is impatient, because I know what you’re going to see when the film premieres is an exquisite, respectful, and pitch–perfect adaptation of my story, its spine fully intact, its emotional tone completely in tune with the original story, and its characters as fully realized as any author could hope them to be when seeing one’s work make the sometimes–bumpy transition from one form of media to another. How do I know this? Because from the beginning, Earl Newton has asked for my input on several of the script elements, and — much to my delight and shock — incorporated some of them into the final script, which I have read and admire tremendously. It’s my story, but it’s Earl’s film; his interpretation, his vision (a horribly over– and mis–used word, but completely applicable here), his baby. And the story could not have been in better hands for my first experience with the world of independent filmmaking. I want to discuss the adaptation process from the viewpoint of one who, after decades of hearing horror stories from others who have seen their work all but butchered when turned into movies, had prepared himself for the worst and was, for once, ecstatic to have been disappointed. This whole thing started as an accidental mouse–click that became a whim and then a reality in almost as much time as it took for me to type this sentence. Here’s how it began: a few months ago, a friend of my wife’s and mine, Lisa Dotzauer, came over and brought with her some CDs, most notably Zoe Keating’s One Cello X 16: Natoma, which I immediately fell in love with. After Lisa left that night, I went online in search of other Zoe Keating albums (Lisa thought that she had recorded only one), found that she had two currently available, and purchased both of them. In the process, I did a search on her, found her website — http://www.zoekeating.com — and while exploring it accidentally clicked on a link to something called Stranger Things Premiere. I was all set to go back to Keating’s website when I noticed that the most recent update was an editorial by Earl Newton, Stranger Things’ Executive Producer, so I clicked on it and was treated to a witty and even trenchant take on why it is that many people have become what are now deemed “webscabs” — individuals who use the Internet to “give away” their work in order to pique wider interest and gain a larger audience. Earl was funny, smart, eloquent, charming… and a goddamn kid — twenty–four, twenty–five tops. But his devotion to filmmaking came across loud and clear, so I figured, what the hell? I decided to take a look at the three films he had running on the site. Here’s what I expected to see: overly–stylized movies that more resembled music videos than actual films with stories and in–depth characterization; shaky, jerky, faux–Cinéma vérité camerawork that made the directors of The Blair Witch Project look as if they’d nailed the camera to the ground; and, of course, oh–so–trendy storylines about modern angst, always artsy, never touching upon anything like a genuine human emotion. Here’s what I did see: three actual films that were deeply concerned with the telling of stories about real people in fantastic — and even terrifying — situations, made by directors who knew not only how to use a camera but also — sometimes more importantly — how not to use it (in other words, there were no Look, Ma, Ain’t I Directing Good? moments, those headache–inducing instances where the camera, for no reason other than the director could and thought it would look cool, gives us a moving shot from underneath a glass plate or shows us something from the perspective of inside a refrigerator or from the tip of a character’s nose hair). No, I was watching films made by people whose primary concern was to tell a good story while drawing zero attention to the visual manner in which it was being told. And the stories were good, compelling, suspenseful, funny, terrifying, and poignant. I am hard–pressed to decide which film is my favorite, because I like Sacred Cow and Sins of the Mother equally. The former is a wondrous yet nerve–wracking tale in the Twilight Zone/Night Gallery mode, the latter a tale that would have found a welcome home on the original Outer Limits. Yeah, okay, he might be just a kid, but he was damned talented kid who worked with equally talented actors and crewpersons, one who knew to respect the story first and foremost, and whose influences were so similar to my own it was kind of creepy. My name is Gary A. Braunbeck; my work has won the Horror Writers Association Bram Stoker Award 3 times, and the International Horror Guild Award, as well. I have published nearly 200 short stories, 10 fiction collections, and 9 novels. I am a former president of the Horror Writers’ Association. I only recently discovered Stranger Things and am just speechless — except to say I greatly admire it and would like to get involved, albeit peripherally, if you’d allow me the chance. I have a particular short story entitled “Rami Temporales” (which appeared in Borderlands 5 — From the Borderlands (Warner Books paperback title) that I strongly believe would make a good candidate for a future ST episode. I could not write a screenplay if my life depended on it (well, okay, maybe if my life depended on it… you get the idea…) but I’d very much like to send a copy of this story to you for your consideration. If you’d care to check out my web page to peruse my credits for yourself, please do so at: www.garybraunbeck.com. I thank you for your time and consideration. Sending it onward, I resigned myself to never hearing back from him (which, with only two exceptions, has been the norm when it comes to follow–ups from filmmakers about optioning my work). We’d be delighted. Send me a copy of your story and we’ll be glad to take a look. I immediately sent “Rami Temporales” Earl’s way, and then decided, This is probably as far as it will go. Once again, I was happy to be disappointed. Roughly a week after receiving the story, Earl read it, liked it (“…gave me a nice vibe…” were his exact words) and said that he’d consider it for a future episode of Stranger Things. He was in pre–production for his next film, What Child is This? and offered his apologies that it would probably be a while before I heard anything more. I was pleased that he was interested, and figured I’d hear from him again in four or five months, when the new film was completed and had premiered. What happened next can only be called serendipitous, because it wasn’t four or five months; it was four or five days when I next heard from him. In a nutshell: due to a family medical emergency, the leading man in the film for which Earl was in pre–production had to bow out, and as a result (the role had been written specifically for this actor) the film was in limbo and Earl — who likes to run a tight ship and keep to schedules as much as is possible in the world of filmmaking — was left without a new project… except for this odd little story that had landed in his e–mail about a week before. Understand that Earl likes to keep the films fresh at Stranger Things, and the threat of viewers having to wait another four, five or six months for a new film was unacceptable. He had a crew, he had most of the actors, and he had an unplanned–for gap in his schedule. Two days, three e–mails, and a ninety–minute phone call later, “Rami Temporales” was a go. What he didn’t know then (but does now) is that I have been a life–long admirer of the great William Goldman: his novels, his screenplays, and his non–fiction — particularly Adventures in the Screen Trade and its equally marvelous sequel, Which Lie Did I Tell? : More Adventures in the Screen Trade. In case you’re not familiar with “Rami Temporales,” it has become one of my most popular stories since its first appearance and has, in fact, brought many new readers to my work, for which I am grateful, because the story is a prime example of both what and how I write; it is the one piece to which I direct people who’ve never read my work before. “Have you ever seen any paintings or drawings of Jesus?” he asked. “Seventy–two, actually. Followers of the Prophet Abdu’l–Bahá believe that everything in nature has ‘two and seventy names.’ That’s almost right. The thing that has always annoyed me about the various religions is that, with rare exceptions, their beliefs are too compartmentalized. This is what we believe in, period. I’ll tell you a secret: they’re all wrong — individually. The problem is none of them can see Belief holistically. If they were all to ‘gather at the river,’ so to speak, and compare notes, you’d be surprised how quickly people would stop setting off bombs and flying airplanes into skyscrapers. But I digress. As you can tell from that excerpt, Listen’s backstory concerning God’s face is somewhat complex (as is the process that led him to find Joel, which — in a truly inspired move by Earl — was reduced from four pages of story to one line of dialogue in the film). You can also tell that the story — like most of my work — relies heavily on dialogue, which is fine for the reading experience but can be deadly on the screen; you might as well film a play word for word. This is where Earl really took over and made the story his own. Because he had to adhere to a one–week–to–ten–day shooting schedule in order to have the film ready for its August premiere, the finished movie couldn’t run more than fifteen or sixteen minutes, so the dialogue had to be pared down to its core elements while still retaining the characterization necessary for the piece to remain emotionally true to the source material. If you’ll take another quick glance at the excerpt from the story, you’ll see that he had his work cut out for him. JOEL: Are there a lot of people like you? LISTEN: I’m not omniscient, I’m just very well–researched. Do you know how many people you’ve listened to? LISTEN: Seven hundred and twelve, if you include that man. Do you know what you are, Joel? You’re a safety valve. People see you, and they know they can trust you with their pain. Do you think it helps them? LISTEN: In fourteen years, you’ve prevented forty–three rapes, one hundred and twelve suicides, thirty–three divorces, ninety–eight murders, and so many cases of spousal abuse I stopped writing them down. Do you know why? JOEL goes to answer, nods his head softly. LISTEN: Do you know why I want the piece back? JOEL: To put it back together again, I guess. JOEL: Things will be better? LISTEN: Not immediately. Not soon. But yes. Better. It also means that, from now on… no one will tell you their stories anymore. You won’t be a safety valve for anyone anymore. JOEL: What happens to those people? LISTEN: They just… do the best they can. JOEL: What does that mean? LISTEN looks at him, says nothing. But the meaning is clear. By trimming the dialogue to its basics, Earl not only managed to retain the tone of the story, but also gave his actors a wide berth in which to create and enrich their characterizations. I have, to date, seen exactly six minutes of finished film, and the actors are nothing short of wonderful in their interpretations of their roles (more on that in a moment). But this is only one element of the film and — as any director will tell you — while good dialogue is a necessity, it is hardly the primary concern when working in a visual medium. A lot can be expressed to the viewer with a simple look, a small, telling gesture, the lighting of a scene, or the visual composition of a single shot within that scene. I have now learned this first–hand: adaptation is much more than just adjusting the dialogue or pruning story elements; it’s an often exhausting process wherein the writer/director has to arrange and orchestrate every separate element in a shot so that each visual, each spoken word, each chord of music and subtle change in the lighting or ambient sounds creates multiple layers, each building upon what came before and reinforcing the base for what comes next — all the while knowing that if any single detail is out of place or just plain wrong, the shot will collapse, and so will the scene. Think in terms of the work of Neo–Impressionistic painter George–Pierre Seurat and his masterpiece Un dimanche après–midi à l’Ile de la Grande Jatte (Sunday Afternoon on the Island of La Grande Jatte), a work considered by many to be the greatest work of Pointillism ever created. Like the reverse of an Escher painting, Seurat’s masterwork is stunning when viewed holistically, yet breaks down when viewed in closer detail (whereas Escher’s paintings, such as The Waterfall, sustain close scrutiny, yet break down into chaos when viewed as a whole). Sunday Afternoon is composed — much like a newspaper photograph — of hundreds of thousands of layered dots that, taken individually, seem to mean nothing. It is only when one slowly steps back from the painting that the dots begin to merge into a breathtaking whole. Every element in every shot of every scene of a film is composed much the same way when you’ve got a serious and dedicated craftsman at the helm. I don’t envy Earl the work he’s put into this. The comparison to Seurat may seem a bit overreaching, but to this neophyte’s eyes, that’s how it appears. Everything I’ve seen of the film thus far — coupled with the numerous discussions Earl and I have had during the course of the shoot and editing — only reinforces my admiration for Earl and his actors and crewpersons; these are people who take their craft very seriously (but not themselves, thankfully), and no detail is too small to dismiss or employ off–handedly. The look of the film is composed very much like an artist with brush in hand would do while standing before the canvas; if you look at any of the stills, each one of them could be pulled from the film, framed, and hung on the wall. To me, each shot is composed as if it were a single painting — or, to carry through on the metaphor, a point in space that combines and layers with other points in space to create an aesthetic whole. Nowhere is this more evident than in the face of Laura Sebastian, the wonderful actress who portrays JoAnna with such honest emotion that there were times I felt as if I were intruding upon someone in the midst of her most intimate and vulnerable moments; her performance is that beautifully–shaded and realized. Hold on a second, I imagine some of you are saying to yourselves. Who’s JoAnna? Isn’t the main character’s name JOEL? But she only half hears him; she’s watching the drunk shamble away, and the look on Laura’s face as she does this is one of such complete empathy that my breath actually caught in my throat; I was watching an actress who had become so submerged in the character she was playing that all that remained of Laura was her body: JoAnna was the rest, right down to the pain in her eyes. (When you see the film — and I hope you’ll take the time to do so — it might amuse you to know that, at the time they were filming this, a large bike race was about to begin, and if it hadn’t been for a brass band warming up to welcome the competitors, Earl and company would not have known. Several hundred cyclists were within minutes of converging on the area, and Earl and his crew had to ask the brass band to stop playing long enough for them to get the scene filmed. Traffic was being re–routed to accommodate the cyclists, chaos and noise galore were about to fall on everyone’s heads like a curse from heaven, everyone was tense and anxious because they hadone chance to get this right… and there is this overwhelming sense of isolation throughout the scene, one filled with silences that speak more eloquently than my words ever could have. What is in the film is, I believe, the first take, and it is a glorious thing to behold. “Sometimes terror and desperation are the greatest motivators of them all,” Earl later told me. The casting of Listen I knew was going to be a problem before Earl even began the first draft of the script. In the story, Listen takes on the form of the late actor Peter Cushing (Joel’s favorite actor) in order to immediately get Joel’s attention. I knew there was no way Earl was going to be able to find an actor who both looked and sounded like Cushing, so I told him that Listen’s age didn’t really matter, but he’d have to come up with a way for Listen to instantly grab JoAnna’s focus… and he did. I won’t reveal Earl’s ingenious solution, but suffice to say that it is so perfect I later found myself wishing I’d used something similar in the story. Listen is played by a young actor named Toby Turner, who looks like a less edgy version of Jeremy Sisto. Toby’s performance is one of quiet power; the face is young, but there are thousands of years of knowledge behind his eyes. I believed I was watching an angel. I was not initially enthusiastic about this change of locale; if it could be said that I’d been “married” to any secondary aspect of the story, then having the climactic scene take place in the park was it. I could not punch holes in his argument, as much as I wanted to. Because what he was arguing for was the right to present hisinterpretation of my story, and he should not have been put in a position where he felt he needed to defend his vision to me. Plus, I agreed with his interpretation and his reasoning behind it. And they got the sequence filmed before the cyclists showed up and the brass band let fly. Which almost brings me to the end of this, my first experience with the process of not only seeing one of my stories adapted for film, but also of having had the rare opportunity to be consulted on several aspects of the process by the filmmaker himself. By the time you’re reading this, One of Those Faces should be live at the Stranger Things website, so I hope you’ll go over and see it, as well as Earl’s other fine films. I said “almost brings me” to the end because, in the weeks since I finished the original version of this essay you’re reading, I have seen the entire rough cut of the film — which runs just under 15 minutes — and I could not be happier with what Earl and his cast and crew have done. Laura Sebastian’s performance is quite remarkable, and each time I view the rough cut, I find a nuance that I had not noticed during the previous viewing. If you find that Laura reminds you of another actress, I guarantee you that it’s Sigourney Weaver. There is a muted but omnipresent intensity about Laura’s performance that often put me in mind of the redoubtable Ms. Weaver (Laura’s physical resemblance to her aside). This is a performance that you don’t so much watch and enjoy (though you will enjoy it) as study and appreciate. Toby’s performance as Listen is one of tremendous subtlety (and I’d be lying if I did not say a part of me fears that in the eyes of some, it may be too subtle for its own good ), but the key to Toby’s performance is his eyes. Nothing else about him may seem ethereal at first glance, until you watch the eyes. Those things seem ancient. And the moment in the alley as he searches for the “place of power” — running his hands along a brick wall as if looking for the hidden switch that will open a secret passage — is one of my favorites in the film. While the majority of One of Those Faces focuses on JoAnna and Listen, the actors who populate the supporting roles deserve their curtain calls, as well. Carol Kahn Parker, who portrays the woman who speaks to JoAnna at the beginning of the film, was, for me, absolutely perfect, not only because her face conveys years of worry, sadness, and struggle that have merged into a kind of grace, but because — and don’t think this didn’t freak me out a little — she looks exactly, precisely as the character in my head looked when I was writing the original story. Don Goodrum, as the alcoholic transient who talks to JoAnna in the alley about one–third of the way into the movie, gives the character a shabby dignity made all the stronger by the sound of his voice — a hoarse, sandpaper whisper, as if the character had spent the last few days screaming at the top of his lungs. And without revealing anything that could possibly spoil either the movie or the original story for you, I can say that Earl has given his film a much more optimistic ending than the one found in “Rami Temporales.” I found myself smiling from ear to ear the first time I saw it, and the more I re–watch the film, the more I like Earl’s ending. I would also be remiss if I didn’t mention the wonderful, evocative score written for the film by Walter Muslo (http://www.cougarmediamusic.com), who was so inspired by the script that he write and recorded a theme song for the movie that you’ll hear under the closing credits, sung by vocalist Kristin Crowe with a haunting, smoldering passion. I plan on cherishing this, the first film to be made based on one of my stories, not only because the story could not have possibly been treated with more respect and care, but because it’s the first time I’ve ever heard actors deliver lines of my dialogue (Earl uses some dialogue from the story almost word for word) — and you know what? It sounds damned nice to my ears. As for my own personal future in movies, I find myself saying, “I’m ready for my close–up now, Mr. DeMille” a lot now when I’m alone. Psychiatrists have been consulted, and proper medications have been dispensed. Re–reading the essay now, I find there’s very little I can add in the way of postscript, except, maybe, for two items: 1) The finished film was beautiful, and Earl and his cast and crew were so very happy to hear how much I admired their work, and, 2) One of Those Faces went on to win Stranger Things the Parsec award — the highest award given to films made specifically for broadcast on the web. And it deserved to win. Not that I’m, y’know, biased or anything. 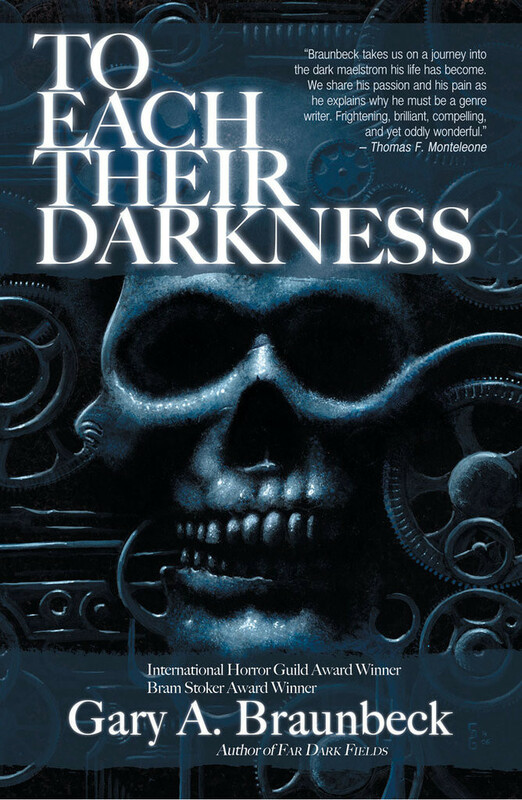 This essay appears in the Stoker Award–winning To Each Their Darkness from Apex Publications. Gary A. Braunbeck is a six–time winner of the Bram Stoker Award. His highly acclaimed Cedar Hill Cycle includes the novels In Silent Graves, Coffin County, and the forthcoming A Cracked and Broken Path. His book on writing horror, To Each Their Darkness (Apex Publications), was a Bram Stoker Award winner in 2010. Please visit him online at http://www.garybraunbeck.com or at http://www.facebook.com/gary.braunbeck.